Into The Fray is an annual tournament held by the 3+ Gaming group in Northcliff (Gauteng, South Africa), this year on the weekend of 28-29 November. It consists of many systems being played over the weekend: 40K, Fantasy (mostly Kings of War now), Warmachine, X-wing, etc. and, starting last year, Flames of War. Last year the FOW event was Late War, this year it was Mid War 1650 pts. Because ETC. While CV Shermans are decent they cost a small fortune and 5.5" Guns I thought would add more than three Shermans. ITF was four games each of three hours duration, two games each day. Both days saw a late start (09:30) as some people apparently cannot keep time. There were ten players in total, and naturally after arguing for ITF to be Mid War 1650, none of the ETC fags showed up. My pics aren't too good: the lighting is not great and my camera was playing-up, hence the darkness in some images. Yes, I missed Table 2 for some reason: you can see it in my last game. Nick started with both Pioneer platoons and the Tiger, while I countered with the 25-pounders and a Rifle Platoon on the left objective, the 5.5"s and anther Rifle Platoon on my right. My right, the 5.5"s had a nice sheltered position though not a shot was fired this side of the table. I killed a Pioneer team first turn with the 25-pounders and bailed the Tigers with the 5.5"s. Nick proceeded to advance with the Tiger, sniping a 25-pounder (he had re-roll misses for his Tiger Ace Skill) He also advanced with the Pioneers on that flank when his StuGs showed up from Reserve on turn 3, thereby pinning my Rifles. Nick advanced with the Pios and then assaulted with the single StuG which my infantry promptly dispatched. Other fire was largely ineffective. In my turn he had moved his Pioneers under the ranged-in marker so I called Mike Target with the 5.5"s on the Pios, ignoring the Tiger for the moment. I hit 5/6 Pioneer team, and Nick's dice obliged by failing all five saves. The Pioneers and the flame-thrower threat gone was great, but I still needed the Tiger out of the picture. A succession of assaults saw the Tiger go down after three rounds to the PIAT, followed by the Sole Surviving Pio command team and the 2iC. With that we called it as Nick had lost three platoon with two on-table, no 2iC or CinC (my 6-pounders had arrived in the centre and killed him in his half-track) and nothing to contest the objective on the left. I would be defending in No Retreat. I deployed a Rifle Platoon and the 25-pounders on the forward objective, 5.5"s at the back and the 6-pounders in ambush. I KO'd a couple of tanks with artillery on Turn 1 and continued to pick off the odd tank intermittently. Eugene attacked on his left, but lost his Recce after attempting to assault my CO, 2iC and a couple of Observers...both armoured cars were bailed by Rifles in defensive fire and then captured. The 6-pounders then ambushed and combined with the artillery proceeded to annihilate the German army over two turns for the loss of a couple of guns. My HQ, about to capture some new rides. ...maybe a 10th platoon I'm forgetting? Knowing that he would defend I called Night Attack immediately to take advantage of darkness and the 6" Spearhead. However, I had forgotten Italians get Avanti moves (British regularly attacked at night and yet Germans and Italians still move faster despite hating night operations: thanks BF!). Night did at least reduce visibility for the myriad of MGs and template weapons I would be facing, but would hinder my own artillery significantly for the first three turns. ...however, the Italians made it to the objective first with two companies, one Fearless Conscript, the other Confident Trained. The two defensive companies were both Reluctant Trained. My Rifles were pinned by artillery after some good visibility rolls: the lead platoon un-pinned, but the rear platoon stayed pinned until the end of the game, five turns all with re-rolls. This made things difficult as I only had one real attacking element, the Carriers easily being countered by elephantinos. Rifles going for a pinning attack. Thankfully the Royal Artillery was in great form and provided a wall of fire in front of my single Rifle Platoon: they decimated the FC company (who would not un-pin or dig-in, whereas the Reluctant guys always did) while the CT Company started taking losses but did succeed in digging-in. The Carriers added MG fire but also took losses from 47mm ATGs and artillery, losing one Platoon and 2/3 of the other though the last Carrier held-on. My Rifles launched a limited assault (no pic) to clear the immediate teams before consolidating back. My artillery inflicted a few more casualties and, crucially, I now had two ranged-in markers right where I needed them. The table in the centre was...open. I think I could have defended quite easily, but in true British fashion I Night Attacked instead. The "south" (after some movement): I deployed the 6-pounders, a Rifle Platoon and Carriers. My 5.5"s were well countered by Colin who put his PaK38s in Immediate Ambush: if my guns fired they would start picking them off. My 5.5"s fired twice in the entire game: once in direct fire (where they killed a Panzer IV) and a bombardment on the last turn that failed to range-in anyway. The first few turn were in darkness and did not see a shot being fired as we both jockeyed for position. Night broke on my turn 4 and then things began in earnest. The "north" objective was held by a pair of 8-Rad, some AA half-tracks and the 88. I launched an assault around turn 3 that got an 8-Rad but which later could not get past the remaining 8-Rad and the flak. In the "south" my 6-pounders took a steady toll on the Panzer IIIs opposing them, but my Rifles refused to unpin for the follow-up assault leaving one tank in action. While various other small actions were occurring and I lost a 25-pounder and two 5.5" guns to tanks or PaK 38s, I kept focused on the objectives and applied pressure on both simultaneously. In the south my Rifles managed to un-pin and finish off the Panzer III Platoon forcing the German CO to contest. In the north my infantry was pinned and never un-pinned, and I struggled to kill the flak track and the remaining 8-Rad as well as the 88. Colin's 2iC meanwhile went on a lone flank attack and succeed to KO'ing two 6-pounders and generally being a nuisance. My third Rifle Platoon advanced on the PaK 38s and managed to kill one, but they lost one team, (naturally) their Platoon Command Team and were then stuck, the 2iC being too far away and occupied at the objective. Since this was not around the objective, I was not too bothered but Colin assaulted them with a Panzer platoon, breaking them for the loss of a Panzer III. This was mostly a distraction from me, but the loss of the Command team and subsequent platoon loss made it an expensive distraction. The Carriers w/.50 cals eventually managed to KO the remaining 8-Rad and flak-track. However, I had no infantry to finish things off (still pinned) and the 88 remained un-pinned which made assaulting with the carrier a bit risky. In the south I KO'd the 2iC with a 6-pounder while my Rifles moved up to hopefully finish off the remaining tanks around the objective. The PIAT managed a flank-shot into a Panzer IV which brewed and the tank platoon broke before I could assault and finish it. In the north I ganged-up on the 88 and managed to snipe him with an MG before assaulting the PaK 38s with Carriers. I also assaulted the 88 Command team and missed...but that was pretty much it as the German army at this point consisted of an 88 Command team and two leaderless PaK 38s with no 2iC or CinC. 5-2 to me, I lost the leader-less Rifle platoon. So, 6-1, 6-1, 5-2 and 5-2 was 22 Pts, enough to take first place. Colin came second (still shocked I tell you...) and Matthew in third place. However, the the vast majority of the player base is new to MW which helps explain it; quite a few were simply playing with what they had. 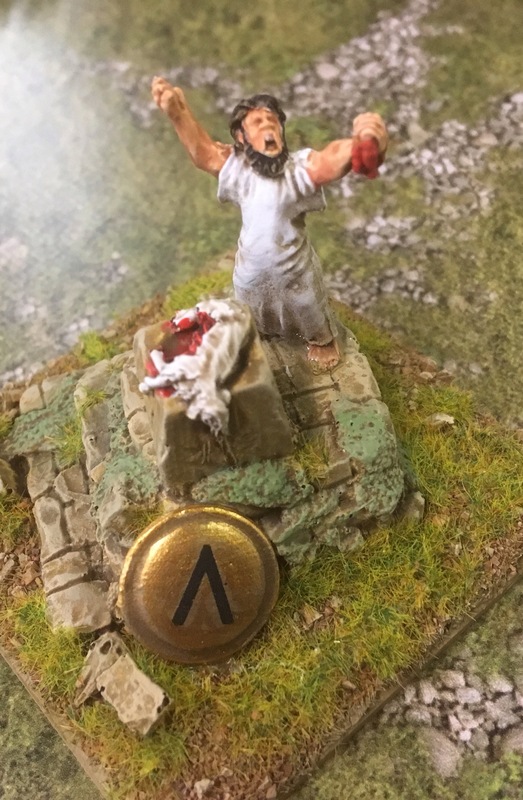 My thanks to the 3+ organisers, to Nick for running the Flames of War tournament and to Peter, Mike and others for the excellent work they do.